After touring a number of assisted facilities, we choose Silvercrest (Woodlands Creek) because the atmosphere and staff made us feel like "home". During our mother's stay, I have nothing but the highest regards for the way the staff treated her. Quality was great from care to atmosphere to activities, etc. The only negative thing was the food. The food is not the best. Woodlands was fantastic. Many thanks to the whole staff. I couldn't have ask for more. Thank you so very much. Professional, caring and loving people. We could not be more pleased with the care our mother received for two and a half years at Woodlands Creek (formerly Silvercrest). The staff was very caring and kind to all residents. Staff turnover is minimal which really allows them to build strong relationships with their residents. We were very blessed to find such a great place for our mother. The staff at Woodlands Creek was very professional and very caring. The place had a warm and friendly atmosphere. The apartment was big, spacious, and very nicely appointed. My parents were residents at Silver Crest Assisted Living facility until it was determined that my father required a higher level of care. This place is “top-notch” on all accounts. Director of health services (Kevin) is the best, and nursing staff is excellent. CNA’s are caring and lovingly provide for needs of daily living. Plenty of well planned activities, Apartments are specious, housekeeping/laundry is provided and there is a beauty shop on site. The facility and campus are beautiful! I can’t say enough good things about Silver Crest. Do check them out! Most of the staff were wonderful to my mother. It must be a very difficult job (memory care unit). I really appreciate their patience and caring. We visited Woodlands Creek. It was beautiful and very clean. We were led by the coordinator, and she showed us all around. The people we met in the hallways and such were very cordial. The residents seemed really happy. We did talk to a man who lived there, and he encouraged us to consider it. The dining area at Woodlands was a big open space with many tables. While we sitting there in the morning, we saw them setting up for lunch, and it looked like the people working for them were doing a good job. Thank you or the kind words. We are happy that you enjoyed your visit. We hope to see you again soon. Caring is the predominate characteristic that we experienced during the 2 years my mother was a resident at Woodlands Creek. This caring philosophy was obvious in the interactions my mother and my family had with all the staff members regardless of their department: nursing, dietary, activities, housekeeping, administration, maintenance. We experienced this care in both Independent living and Assisted Living. In the last few months of my mother's life, the Woodlands Creek staff worked collaboratively with the hospice staff from an outside agency to keep my mother comfortable and ensure that she had a peaceful death. Our journey through my mother's time at Woodlands Creek was easier because of a knowledgeable, professional, and caring staff. They put the resident and family first. Excellent, caring, kind. We always felt that Ralph was in a lovely, safe environment surrounded by people who cared. Very kind and caring staff! Very knowledgeable about caring with the elderly. They were our eyes and ears. Thank you so very much for caring. We visited several homes prior to picking Woodlands Creek. The facility is excellent. The staff is first rate! My mother was there for five years and we have zero complains. It is a five star facility. The staff at Woodlands Creek were absolutely amazing. They took wonderful care of our dad and we are so grateful for the way they took him in as family. They worked with us throughout dad's time there so well . A+. Our Dear Mother, Marcella, was a resident at this facility for 4 years. We moved her from WI to IA and it was a difficult move. The friends/family she met at Woodlands Creek made it an extremely easy move for her. She loved the staff as well as the food and activities at this facility. Our family will never forget this beautiful facility and the employees that were always there for her. My family highly recommends it. Thank you for your kind words and for the opportunity to care for your mother. It warms our heart that you had such a good experience here at Woodlands Creek and we were happy to have her as part of our family. This company is beautiful. I am so excited for my parents to move into this community. The staff are such great people. We visited Woodlands Creek for my mother. It was a beautiful place. Very lovely. The staff seemed very good. The apartments were beautiful. They were very nice. The activities seemed very good. There were lots of stuff. The dining area looked very nice. It was kind of restaurant style. The facility seemed clean, very friendly, and very comfortable. Our mother is currently a resident at Woodlands Creek. This is an excellent facility which provides a high level of service through a knowledgeable and caring staff. We feel Woodlands Creek provides good value for the services they offer. Thank you for the kind words. We are so happy to hear how much you enjoy having your mother live at Woodlands Creek. We will certainly pass these kind words on to our staff. Woodlands Creek was a very nice place, but it wasn’t in the right location for us, and it was expensive. We liked the rooms. They have a lot of activities and continued to send us invitations for different things they have going on. Thank you for your nice review. I am sorry to hear that we were not the best fit for you but we wish you luck in your search and hope that you find a great community. Woodlands Creek was high on our list. Everything about it was very nice. It had wonderful facilities, a good location, and the staff was great, very friendly, very nice, and very professional. Thank you for your nice review. I am certainly glad to hear that you enjoyed your visit to Woodlands Creek and I hope that we see you again soon. Everyone was very helpful and had smiles on their faces. I felt very comfortable. Everything was clean and the facility was beautiful. Very close to where my parents Dr offices are. Will be moving my parents in! Thank you for your great review. We are so excited to have your parents living here at Woodlands Creek! Woodlands Creek was clean and very nice. The staff was very open and very helpful, very courteous. Very nice dining room and a good selection of food. Thank you for your wonderful review! We are so happy to hear about your wonderful experience at Woodlands Creek. We hope to see you again soon. I am in Woodlands Creek. The staff is patient and caring. The apartment is clean. They serve our food, and it is good. My experience here is good. Thank you so much for your review. We are so appreciative of your kind words and we are so happy that you are enjoying yourself here at Woodlands Creek! Woodlands Creek is affordable, mom has a friend there, and she is more familiar with it. They accept pets. The staff was fine. Everyone looked very nice. The activities were similar as the other places. She wanted to be closer to where the activities are. Thank you for your wonderful review. We are so glad that you had a great experience at Woodlands Creek. We try to ensure every day that our residents love the way they live and that has helped us to become one of the highest ranked communities in the country when it comes to resident satisfaction. We are dedicated to listening to the needs of our residents from what kinds of activities they enjoy to what their favorite meals are. Again thank you for the review and we hope to see you again soon. Woodlands Creek was the best that I found in the area. I liked the environment. The rooms were good. They had a lot of activities in the afternoon, and they had bridge there almost every day. The dining area was like a ski lodge in Colorado. It had big wooden beams. It was large and airy. The furniture were very good. One of the rooms that I looked at, which she called the deluxe, was very light, very airy, and it was probably the nicest one I had been in. The only thing that would rate it down was that their program was an a la carte system. Their services went by points. If you needed assistance in laying out your medicines, that's 2 points. If you needed help in the shower, it's 10 points. Their meal was also a point system. Breakfast was 5 points, supper was 5 points, and dinner was 10 points. With your monthly rent, you would be given 310, which would mean 10 a day. They were cumulative within the month; if you don't use you points within the month, you couldn't carry them over. I like the staff at Woodlands Creek. They seem very nice and really care about the residents. They go above and beyond what is required of them. The rooms are big, clean, and nice. I ate there once, and they have very good food. My mother participates usually about twice a day in activities. I am very satisfied with what they provide. I like the programs that Silvercrest At Woodlands Creek offers. I also like the way the facility was setup. I took the tour and they were very good about answering my questions. I like their rooms. Most of them seemed light and airy. One thing I also like is that you can either eat your breakfast downstairs or you can eat it in your room. They gave me their current monthly newsletter where activities are being included in. They also have a shuttle that on certain days would take you to one of the grocery stores in the area. Our mom was a resident for 11 years. She was always happy there and loved all who cared for her. She lived in independent living. The apartment was spacious and bright with many windows. Woodlands Creek is very new, very nice, and very elegant. The rooms were nice. They have good dining facilities, underground parking. They have an assisted living facility attached to it, which is nice. It was all very good. Thank you so much for your wonderful review and kind words. Thank you so much for your wonderful review. It warms our heart to hear how happy you are! Features Extra: Library, Fitness Room/Gym, W/D In Apt., We Offer 24 Hour Onsite Security, Wellness Nurse For Independent Living. At Woodlands Creek Active Retirement Community, you will receive the privacy, care, and attention you need for an enriched and fulfilling life. We are nestled in a quiet area just off of Northwest 128th Street, you will spend your days relaxing, fishing, enjoying long walks, and experiencing the type of senior living you have always wanted. We don't just offer senior apartments, we are also a full service Assisted Living with an additional Alzheimer's and Dementia Community. We provide excellent care and offer amazing recreational activities that will provide you with the perfect amount of enjoyment you need during your retirement. Our care staff will offer you the type of one on one attention that is expected from one of the top Senior Living Communities in the Des Moines area. Woodlands Creek is an active retirement community offering Independent Living that allows you a full range of customized services. Our spacious apartments are equipped with full kitchens, individual controls for heat and air, hook ups for television, phone and internet, smoke and fire detectors and washer and dryers. Our Independent Living residents can enjoy three chef prepared meals a day, underground parking, and an active social life with an array of activities and outings throughout the day. Woodlands Creek ensures that residents enjoy the benefits of living in a community while still enjoying their privacy, independence and maintaining their dignity. 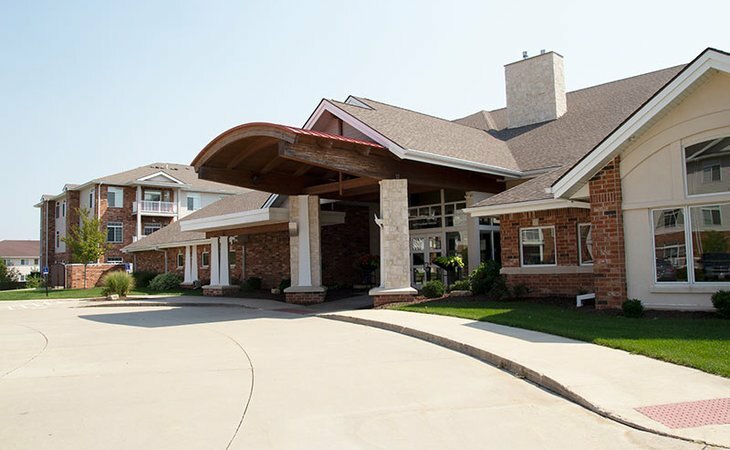 We are proud to be one of the most well regarded retirement communities in the Des Moines area, offering the perfect balance of Independent Living, Assisted Living, and Alzheimer's/Dementia Care. We recognize that not all of our residents will have the same needs. That is why we also offer Assisted Living and Alzheimer's/Dementia Care. Your loved one will be attended to with the utmost care and concern by an experienced and professional staff. Our goal is to provide our residents with the opportunity to enjoy life with privacy and dignity while receiving the care and support they need to Love the Way They Live. At Woodlands Creek we encourage independence with the safety, security and comfort of our residents as our primary focus. We are nestled in a quiet area just off of Northwest 128th Street, you will spend your days relaxing, fishing, enjoying long walks, and experiencing the type of senior living you have always wanted. Restaurant style dining, community room, library, wellness center, whirlpool bath, IL apts have full size kitchens, AL apts have kitchenettes, heated underground parking. What should caregivers and potential residents know about Woodlands Creek?